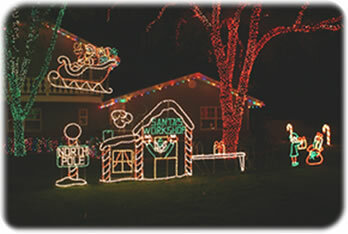 Commercial christmas & holiday light displays and yard decorations, 100's of Christmas and holiday themed items. Pole mounted Christmas and holiday decorations for use on street lights and light poles. Commercial garland and 3D Christmas tree displays, in a variety of sizes, colors and styles. Christmas and holiday wreaths, from pole mount to large size building decorations. Holiday skyline decorations designed to be mounted across streets and entrances. Banners for all seasons, spring - summer - winter - fall, and of course for the holidays. Many of our banners are available with your custom imprint, logo or message. Building facade decor including Christmas decoration and holiday decorations for business facades, building fronts and other streetscapes. Christmas and holiday lamppost decorations. Lit and garland/lit silhouette signs to convey your holiday message. Patriotic lamp post banners and decor. Perfect for celebrating the 4th of July, Memorial and Veterans day. Creating a memorable experiece that your customers will not soon forget is a breeze with our design team. It costs less than you think to make the installation, takedown and storage of your banners and Holiday decorations hassle free. We offer many types and themes to fit your signature style - from the traditional to the unusual. Make a lasting impression that guests will remember and keep them coming back for more. Light shows bring the night to life and warm the heart with traditional displays that evoke the memories of holiday's past. Our wide selection includes decor for every mood and venue, from the traditional and folksy, to the elegant and sophisticated. Decorate your streets and shops! Turn your downtown into a center of holiday cheer with decorations for the busiest shopping season of the year..
07 Spruce Up Your Shops Decorate your streets and shops! Supplying commercial Christmas decorations online. eDecorsource provides holiday decor and special event decorations for commercial, municipal, outlets/malls and retail businesses. We carry commercial quality indoor and outdoor Christmas decorations, light shows, lights, banners and all manner of commercial decor and decor accessories for Christmas decorating projects large and small. Supplying indoor and outdoor decorations for commercial, municipal and large residential decorating and holiday beautification projects; eDecorSource.com represents the largest manufacturers of quality banners, Christmas decorations and holiday lighting products in the country. For information on our other products and services, including enclosed mall holiday decorations, light show events, kiosks and retail merchandising units, visit our design division web site, www.bradyandartists.com.